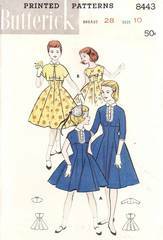 This original vintage Butterick 8443 pattern is for a girls empire princess seamed dress and abbreviated jacket. Dress with scoop neckline or round neckline with small collar. Optional lacy bib. Matching jacket with short or 3/4 length sleeves. Pattern is complete. Pieces have been meticulously cut and folded. Envelope and contents are all in very good and well preserved condition.